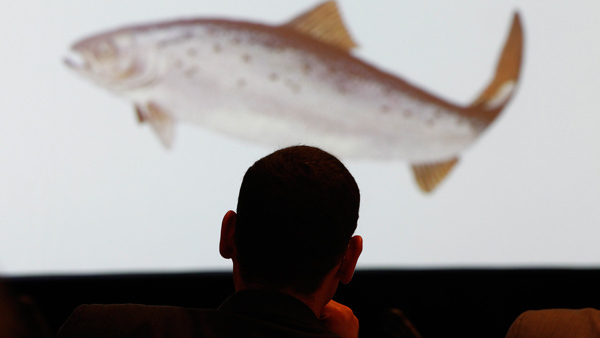 By MARY CLARE JALONICK Associated Press -- The Food and Drug Administration on Thursday approved genetically modified salmon, the first such altered animal allowed for human consumption in the United States. The Obama administration had stalled in approving the fast-growing salmon for more than five years amid consumer concerns about eating genetically modified foods. But the agency said Thursday the fish is safe to eat. In announcing the approval, the FDA said that there are "no biologically relevant differences in the nutritional profile of AquAdvantage Salmon compared to that of other farm-raised Atlantic salmon." AquAdvantage Salmon was created by the Massachusetts-based company AquaBounty. Ron Stotish, the company's CEO, said in a statement that the fish is a "game changer that brings healthy and nutritious food to consumers in an environmentally responsible manner without damaging the ocean and other marine habitats." The fish grows twice as fast as normal salmon, so it reaches market size more quickly. It has an added growth hormone from the Pacific Chinook salmon that allows the fish to produce growth hormone all year long. The engineers were able to keep the hormone active by using another gene from an eel-like fish called an ocean pout that acts like an "on" switch for the hormone. Typical Atlantic salmon produce the growth hormone for only part of the year. The FDA has also said the fish is unlikely to harm the environment. The fish would be bred female and sterile, though a very small percentage might still be able to breed. The company has argued the potential for escape is low. There is no evidence that the foods would be unsafe, but for some people, it's an ethical issue. Some retailers have pledged not to sell the salmon, and it's still unclear whether the public will have an appetite for the fish if it is approved. Genetic engineering is already widely used for crops, but the government until now has not considered allowing the consumption of modified animals. Although the potential benefits and profits are huge, many people have qualms about manipulating the genetic code of other living creatures.